Taxi Hailer – Flag A Cab, Look Like A Dork | OhGizmo! By Andrew Liszewski on 03/26/07 • Leave a comment! I don’t know about you but where I live I can see taxi drivers avoiding me if I were waving one of these things in the air. 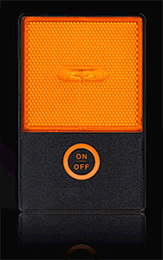 The Taxi Hailer is a credit card sized device (though a bit thicker at 5mm) with a bright orange light that’s supposedly highly visible both day and night. The idea is to wave it around when you’re trying to hail a taxi since it increases the odds of a cab driver seeing you. Using the device is dead easy with a simple on/off button and the light is claimed to run for at least 100 hours on 2 user replaceable lithium cell batteries. And if you’re the corporate type you can even order the Taxi Hailer branded with your company name and logo. Like I said before the cab drivers I usually deal with will probably be more likely to ignore me if I was waving this thing around but given the Taxi Hailer website uses images of Big Ben and such I suspect things might be different with London cabbies. From what I’ve heard they actually know where they’re going too. The Taxi Hailer is available on their website for about $20.